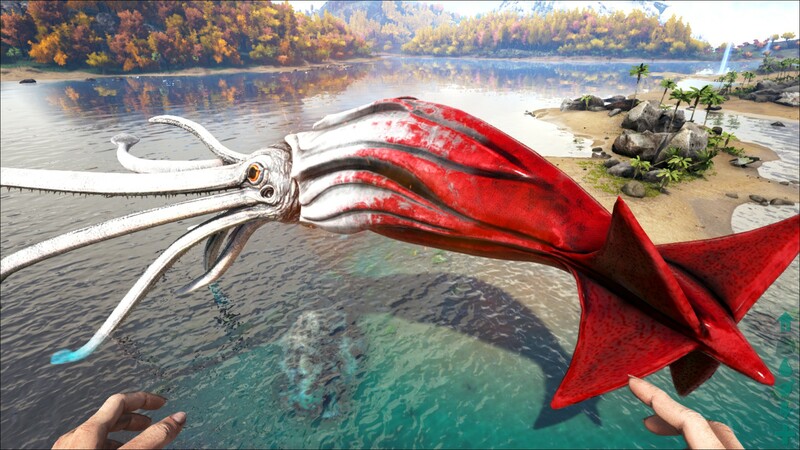 The Alpha Tusoteuthis is one of the Alpha Predators in ARK: Survival Evolved. Identical to a regular Tusoteuthis, but larger and colored red. They have a matching red aura around them, which makes them easy to identify from a distance. This section displays the Alpha Tusoteuthis's natural colors and regions. 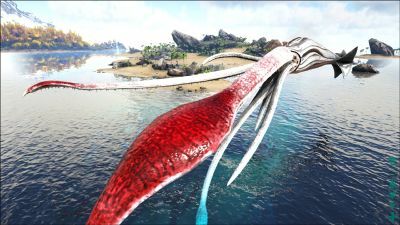 For demonstration, the regions below are colored red over an albino Alpha Tusoteuthis. The colored squares shown underneath each region's description are the colors that the Alpha Tusoteuthis will randomly spawn with to provide an overall range of its natural color scheme. Hover your cursor over a color to display its name and ID. For example, "cheat SetTargetDinoColor 0 6" would color the Alpha Tusoteuthis's "body highlights" magenta. 5The Alpha Tusoteuthis is incapable of drowning. The Alpha Tusoteuthis swipes its massive tentacles at the target. The Alpha Tusoteuthis can pick up another creature with its tentacles. While holding a non-friendly target, the Alpha Tusoteuthis will constantly inflict Torpor until the target is unconscious. Note that the Alpha Tusoteuthis cannot hold an unconscious target. The Alpha Tusoteuthis releases a large ink cloud to completely obscure vision for a limited time. While carrying a creature with its tentacles, the Alpha Tusoteuthis will crush the target for considerable damage. This section describes how to fight against the Alpha Tusoteuthis. Use a high tier crossbow or multiple low end ones to shoot it while mounted. When it starts to flee drive your mount into it and start attacking; don't give it a chance to heal or you will die, attack with the mount and crossbow if it gets too far away. Alternatively, you can use a high level Basilosaurus to attack it. A high level Basilosaurus's health pool combined with its unique surface healing makes it easy to slowly drain the alpha's health. They are also immune to the shocks from any Cnidaria and Electrophorus that may attack you while fighting. 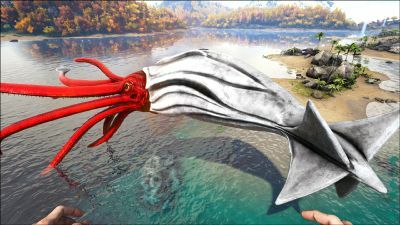 Because of its massive health pool, killing an Alpha Tusoteuthis with hand-held weapons will take a long period of time. As with any other Tusoteuthis, the Alpha will avoid the surface, and will grab unmounted players, so only underwater ranged weaponry will be effective, such as the Crossbow, Harpoon Launcher, and Tek Rifle. 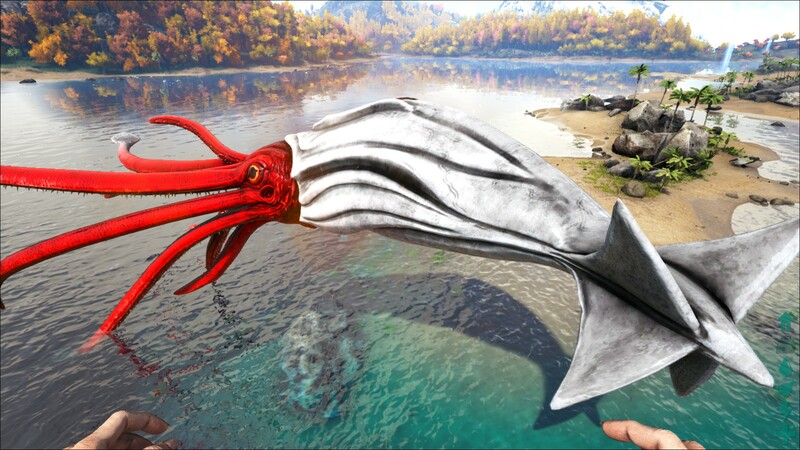 It hits twice as hard as a normal Tusoteuthis, is extremely fast, and it can grab any creature except a Giganotosaurus and crush it to death. The Basilosaurus's unique immunity to movement-impairing effects also makes it immune to being grabbed. Attacks directed at its beak will inflict 3x damage. Can grab you and drop you off outside world, be aware of this and stay away from the sea bed / world border! 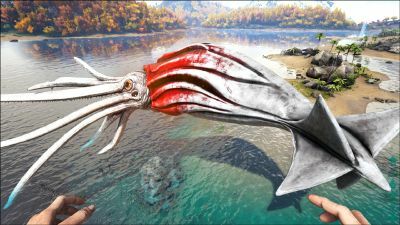 Spinosaurs are able to attack a Tusoteuthis after being grabbed.